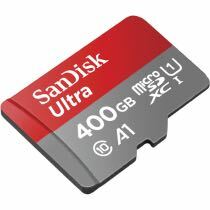 Capture life at its fullest with the breakthrough capacity of this 400GB microSD™ card. 400GB(*) means that you never have to worry about what to delete. Rated A1 for faster app performance to launch and load apps faster than ever before(**). Built to perform in harsh conditions, SanDisk Ultra microSDXC UHS-I cards are waterproof, temperature-proof, shockproof, and X-ray proof(4). The 400GB(*) microSD card is rated Class 10 for Full HD video(3) recording performance and comes with an SD™ adapter and a 10-year limited warranty(5). Your content moves blazingly fast. Now you can transfer up to 1200 photos in just one minute(7). With a breakthrough capacity of 400GB(*) on this microSDXC card, you can store up to 24 hours of Full HD video(8) without worrying about running out of room for all the high-resolution videos and photos, music, movies and other files you want to shoot, save and share. Available from the Google Play™ store, the SanDisk Memory Zone app lets you view, access, and back up your phone's files in one location6. It can also automatically move files from your device to your memory card to free up space. SanDisk Ultra microSD UHS-I Cards are shockproof, temperature-proof, waterproof, and X-ray-proof(4) so you can enjoy your adventures without worrying about the durability of your memory card. Shoot photos and Full HD video(3) continuously without having to worry about running out of space. Capable of storing up to 24 hours of Full HD video(8), the SanDisk Ultra microSDXC UHS-I Card lets you shoot, save, and share without interruption.